Mahogany is an established neighbourhood, and is home to 200 families. It’s full of wonderful community features ready to enjoy, like Major W. Ross Chamberlain Park, Mahogany Park, and Manotick Walk. 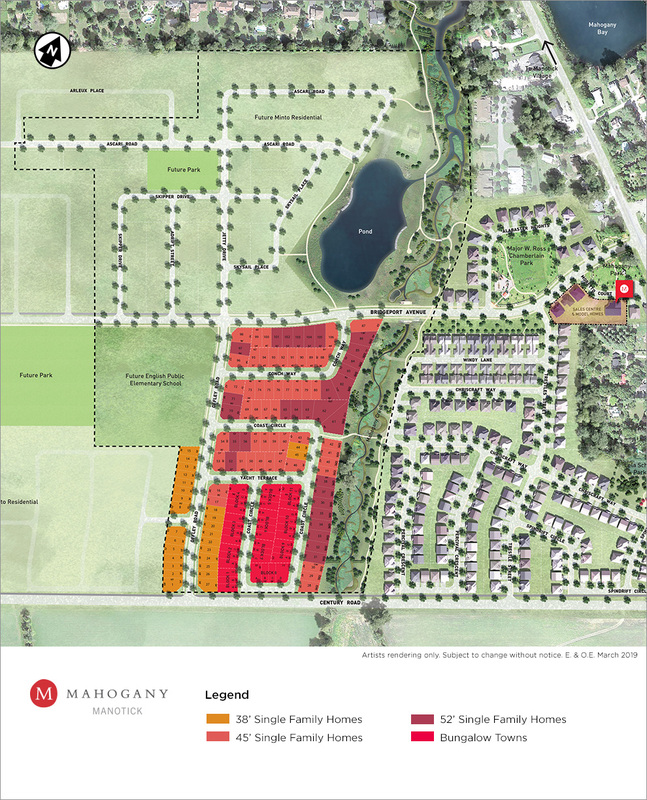 Phase One is complete and Phase Two of Mahogany - now on sale - has been master-planned to bring two new parks and two ponds, kilometres of trails for running, snowshoeing, or family strolls, and over 50 acres of protected natural parkland to the community. With a unique collection of homes, including Bungalows, Bungalow Townhomes and Single Family Homes on 38’, 45’ and 52’ lots, there’s something for everyone. Phase Two includes a new English Public Elementary School located in the centre of the Mahogany community. Want to know more about the latest features at Mahogany, Manotick? Read more. E.&O.E. Renderings are artists' concept only. Subject to change without notice. Mahogany was created with a number of beautiful parks and green spaces, making use of the gentle hills and water features of Manotick. Unique elements referencing the history of Manotick add to this community’s charm — like the masonry pattern that matches Watson's Mill. A large mature maple tree greets you as you enter, and historic trees — including the endangered Butternut species — have been carefully preserved and protected within the community. Explore your future neighbourhood, meet homeowners, discover contemporary home design, and learn more about our community park development below. without having a negative impact on the natural features of Mahogany.